"Fans of radio rock won’t complain, but there’s simply nothing remarkable here." Between sparse flashes of quality, ‘Goliath’ is underwhelming hook-minded chug metal. 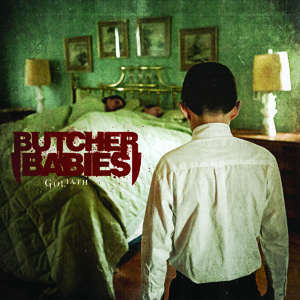 Which itself doesn’t make the debut album of Los Angeles’ Butcher Babies particularly offensive, but there’s so little in their product that betters any other aggro-centric metal. Cookie-cutter riffs and too many moments like the unwieldy chorus of the filler-esque ‘The Mirror Never Lies’ undo the decent efforts of tracks such as ‘I Smell A Massacre’ and ‘Grim Sleeper’, and the rest of the record needed that same attention. Fans of radio rock won’t complain, but there’s simply nothing remarkable here.